Address: 5730 Midnight Pass Rd. Distinguished among all other communities for its lavish grounds and abundance of amenities, the thirty-two acre Gulf and Bay Club encompasses the very essence of paradise. Located on the eight-mile barrier island of Siesta Key, home to one of the world's most beautiful beaches, this elegant resort leaves nothing to be desired. 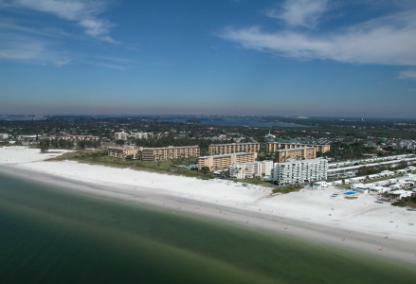 The exclusive and gated Gulf and Bay Club has 850 linear feet on the number one beach in America, Crescent Beach. The vast property consisting of six midrise buildings positioned around the two beautiful freshwater lakes, houses 392 residences. 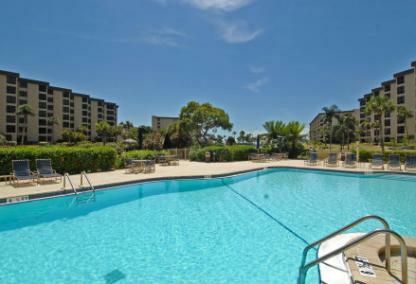 Many of the units have ocean views, which allows for nightly viewings of the spectacular Gulf sunsets. The four spacious floor plans offer options for every taste with units ranging from 1,445 – 1,535 square feet of living space. Residents enjoy a short stroll to the private beach or across one of the footbridges to the unique and charming island in the middle of the lake. The possibilities for recreation are endless with a community social director organizing tennis, golf outings, bingo and other group activities. 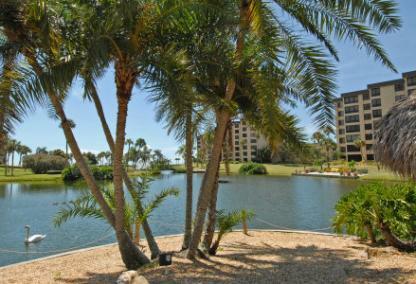 Residents enjoy the benefits of luxurious resort living with an array of amenities. Additionally, the lush and tropical grounds include two scenic courtyards, two fully stocked freshwater lakes, a gazebo, and grilling areas throughout the property. One of the favorite features of this marvelous is the Island picnic area, which includes grills, tables, Tiki bar, and everything else needed for an afternoon or evening full of fun. Those looking for a luxury real estate investment with top earning potential have found it in the Gulf and Bay Club. Investors love this condominium for its professional on site management team and liberal rental policy. With the prime oceanfront location, exquisite grounds, and extensive floor plan options, residents and guests feel they have arrived at their very own tropical paradise. The Gulf and Bay Club's favorable location near the world-renowned Siesta Key Beach and Siesta Key Village add to its appeal. Within a twenty-minute drive, one can enjoy plenty of shopping, dining, recreation, and nightlife at the popular St. Armand's Circle, Lido Key, Longboat Key, and Downtown Sarasota.